Conventional Subdivision (above left with 2 acre house lots) vs. Conservation Subdivision (above right with just under 3/4 of an acre, 30,000 sq. ft., house lots) with the SAME number of home sites (55) on a 130 acre site. The conservation subdivision preserves almost two-thirds of the site, 62%, 81 acres. Conservation subdivisions (we also refer to them as "natural neighborhoodsTM") greatly reduce or eliminate stormwater run-off due to large tracts of natural areas that absorb and filter water. Narrower, shorter streets reduce impervious areas while swales instead of curb and gutters absorb storrmwater instead of polluting lakes, rivers and streams. Conservation subdivisions preserve 50% - 70% or more of the buildable land, plus unbuildable wetlands, steep slopes and floodplains. They can be 10 acres like Trim's Ridge, 177 acres like Sugar Creek Preserve or 2,300 acres like Bundoran Farm. In urban, sewered, high density areas zoned at 2-3-4 units per acre, preserving 40% open space, in addition to the unbuildable wetlands, floodplains, and steep slopes, is the norm. In rural, suburban edge areas at densities of 5 and 10 acres per dwelling, easily 70% or more of the land can be preserved. 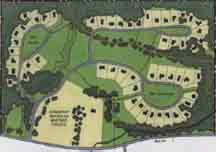 The same number of homes can be built as allowed in conventional "cookie-cutter" subdivisions. Conservation subdivisions are proven more profitable, less costly and faster selling than conventional subdivisions. You can preserve land, water and wildlife by making conservation subdivisions standard in your community.